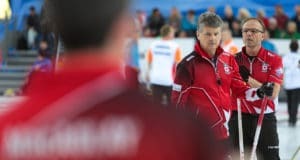 Pat Simmons got the shot he wanted with last rock and then made it to give Team Canada the 2015 Tim Hortons Brier, presented by SecurTek Monitoring Solutions, championship. 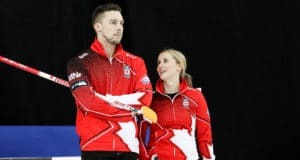 The draw, the point and the championship brought to a dramatic and successful end Team Canada’s tough battle with Jacobs, the reigning Olympic champion, and their stressful week that began with three losses in five games and a dramatic changing of skips on Tuesday. The victory was worth $82,000 plus 45 Team Ranking System points for Team Canada. 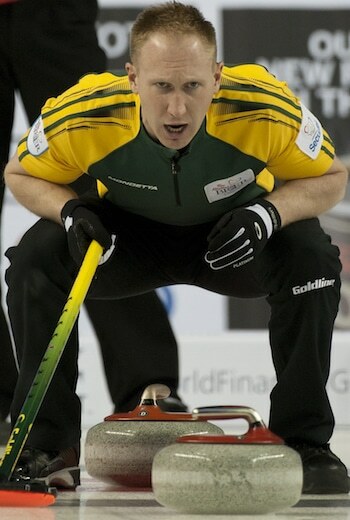 Simmons, Morris, second Carter Rycroft, Thiessen, alternate Tom Sallows and coach Earle Morris will represent Canada at the Ford World Men’s Championship, March 28-April 5 in Halifax, in addition to qualifying for the 2015 Home Hardware Canada Cup in Grande Prairie, Alta., the 2016 World Financial Group Continental Cup in Las Vegas and the 2016 Tim Hortons Brier in Ottawa. The team will also receive Sport Canada funding of $144,000 over two years. Team Jacobs, with third Ryan Fry, second E.J. Harnden, lead Ryan Harnden, alternate Eric Harnden and coach Tom Coulterman take home a total of $62,000 and 35 CTRS points. Simmons, who shot 93 per cent in the final, was named winner of the Hec Gervais Award as the playoff most valuable player, which didn’t surprise Rycroft at all. 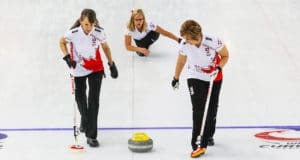 The teams blanked the first four ends, traded deuces in the fifth and seventh, Jacobs took one in the eighth before Canada took control with three in the ninth. Simmons made another perfect draw to the button around a guard after Jacobs last rock was centimetres short of getting to second shot. “It was my first one that killed us, when I bounced off and left him a shot to lay three,” said a disappointed Jacobs who was trying for his second Tim Hortons Brier win in three years. “We kind of missed the line call on my last one and left him a draw for three. It’s pretty tough to come back after that. “It was a back and forth game. That three in the ninth killed us. What are you going to do man, life goes on. We did everything we could to win but it wasn’t meant to be. The win put an emphatic stamp of approval on Morris’s decision on Tuesday, to step down as skip and let Simmons move up from third. Morris said at the time it his instinct that told him to offer to make the swap. Since then the team won eight of its last nine games – its only loss coming in their final round-robin game to Jacobs.